With credit to James Villanueva’s Slatontx.wordpress.com blog, here is a slice of life during that time. With one 25 horsepower Fair-Banks-Morse engine, shipped via Santa Fe Railroad, Slaton leapt out of the darkness when the Slaton Power Plant opened. The, “roaring twenties,” came to Slaton. The Elliot family watched as an electric lamp illuminated their home. That same day, in approximately one-hundred other houses across town, oil lamps burned out; electric bulbs took their place. Of course, electric service was only offered from dusk until midnight. Slaton was never the same. In the years of prohibition and flapper dresses, the worlds first ocean liners took to the seas and aeroplanes took to the skies. It was also the year Henry Dixon Loes wrote the children’s gospel hymn, “This Little Light of Mine.” Which later became an anthem for the Civil Rights Movement. Prior to electricity in homes, select businesses, such as movie theaters, had electricity that was produced by low voltage generators. Electricity in households was a new development even in large cities and many families had apprehension of such a strong surge of power entering their homes. It had only been 24 years since George Westinghouse introduced the public to the Westinghouse Electric Company in 1895 in Buffalo, New York. 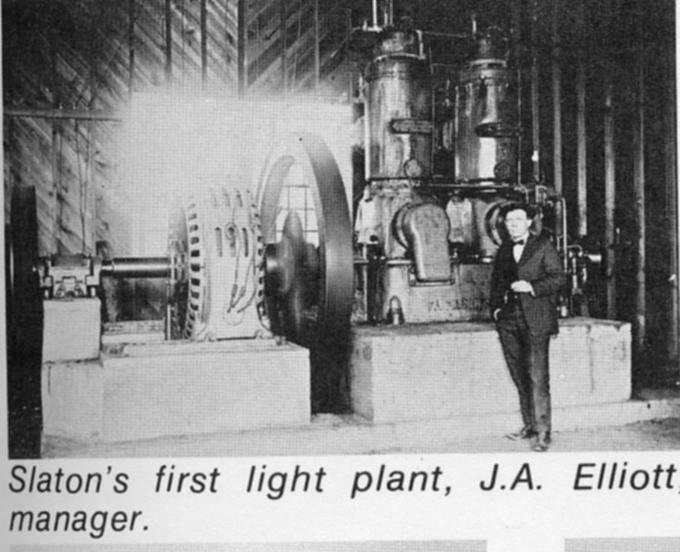 In 1921, fifty more Slaton families introduced electricity into their homes. This same year, the Hodge family decided that Slaton would become their new dwelling after leaving their hometown, in Montgomery County, Texas. Also taking advantage of this, “gold rush,” and prosperity was Jesse Herman and Verna Dale Brewer who moved to Slaton in 1915 from Duncan, Oklahoma. Jesse, who went by J.H., became the first president of the First State Bank. Like the rest of the country, the 1920’s proved to be a prosperous time for the Brewer family who built their home on 410 W. Garza. The home became the site of various social gatherings and parties that would bring in the social elite of Slaton. The Brewers became one of the most influential first families in the twenties. Verna was president of the PTA and highly involved in the Civic and Culture Club. J.H. was the Director of the Chamber of Commerce, president of the Rotary Club, and was named the Democratic party precinct chairman. On many nights, various people would gather at the Brewer home for their very popular, but exclusive, Bridge Club. James Arthur Elliot, the man who brought electricity into the Brewer household, was acquainted with the Brewers. Elliot’s wife, Sarah Callhan Elliot, was also a member of the Civic and Culture Club. After Mr. Elliot’s discharge from service following WWI, he came to Slaton to organize the Slaton Power and Light Company. The engine used only generated enough electricity to be offered in homes during the evening hours, “from dusk until midnight,” as it is written inSlaton Stories. As electricity grew in popularity throughout Slaton, including in the Brewer household, the Bridge Club parties and gatherings became ever more popular. From the back of the Brewer home, the Hodge family could hear all that took place. “It was a lonesome place,” Dora F. Johnson Hodge wrote. “We lived in the servants’ quarters in the back of the Brewer home.” However, the Hodge family didn’t stay long and eventually moved to a location near the Santa Fe Reading Room. “We lived in a box car that had two rooms,” Mrs. Hodge wrote. This was in 1923. On the outside, as technology advanced, Slaton grew and the future seemed vibrant and illuminating. During this time, the community gathered in friendship and camaraderie as children sang, “Let it shine, shine, shine… Let it shine,” all completely unaware of the challenges this new decade in Slaton would bring.